Pond algae is a very common problem, and once it has overtaken a pond, it can seem like a daunting task to get rid of it. Algaecides and other copper-based chemicals often give short term results, but they aren’t the best solution because they aren’t environmentally friendly and they don’t address the cause of the problem. 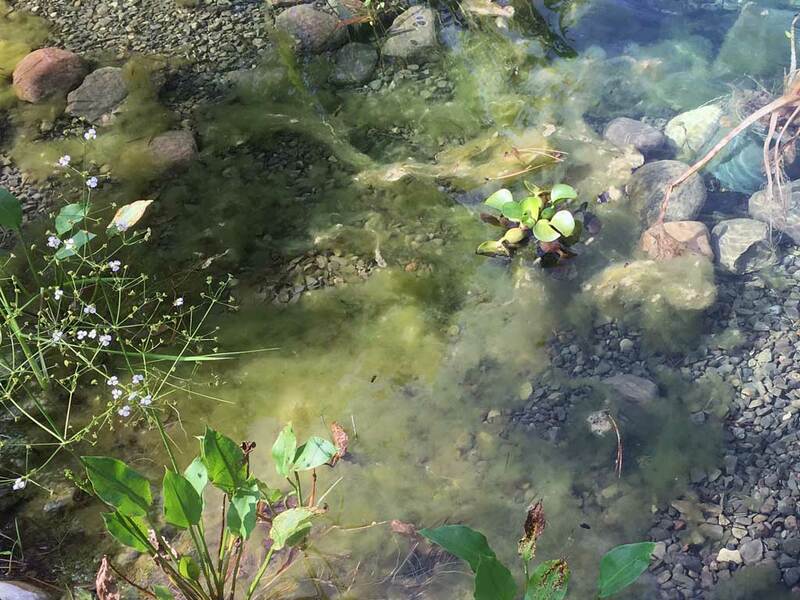 A proactive approach to solving pond algae works with nature to get to the root of the problem, to naturally create a balanced ecosystem and improve the overall water quality and clarity of the pond. This proactive approach may take longer to eliminate the algae, but will result in long term results. Adding aeration is the most effective way of improving your pond’s water quality. By increasing circulation and oxygen levels aeration will help to reduce algae, improve water clarity, reduce sludge and muck and create a more balanced ecosystem. To learn more about how aeration can benefit your pond, see our Large Pond Aeration – The Key to a Clear Natural Pond. Filamentous algae differs from submerged pond plants in that it has no defined root system. It can form gooey clumps of slimy algae, or more fibrous dense strands or mats. In the spring, it often grows in shallow water, clinging to submerged, but as the water warms up, it begins to float on the surface as well. Common types of algae include Spirogyra and Chara. 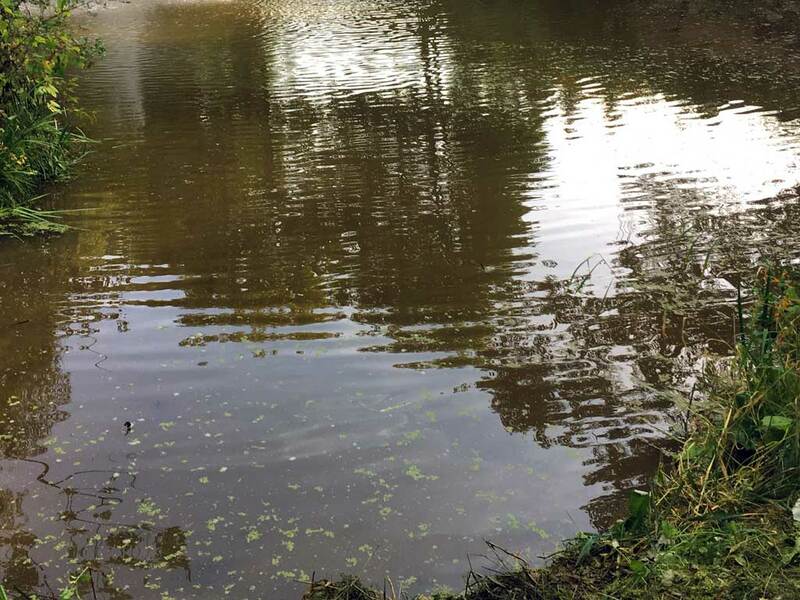 Some algae growth is normal in ponds, however, ponds with thick layers of sludge usually have significant algae blooms that can overtake ponds and become very unnattractive. Early in the spring, filamentous algae can often be controlled with pond dye, such as Natures Blue, Twilight Blue or Black Dyemond pond dye. 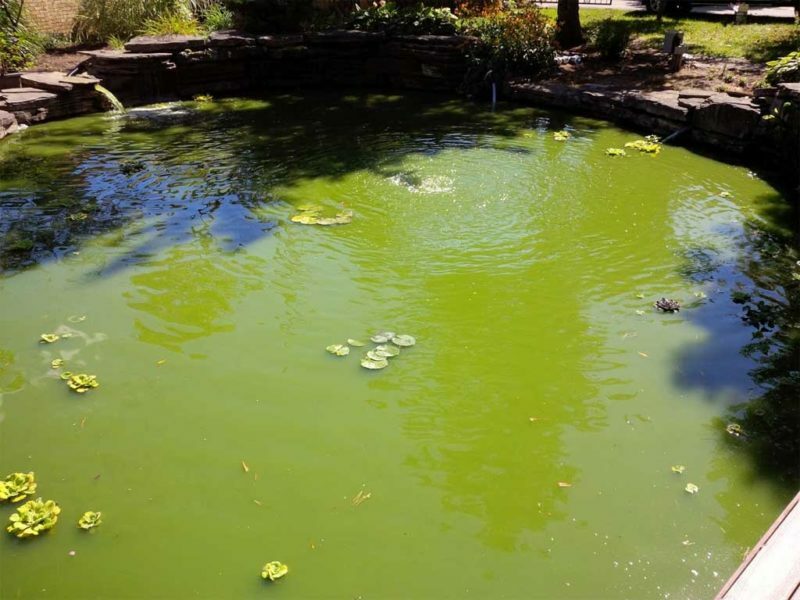 If pond dye is added early enough, before the algae reaches the surface of the pond, pond dye can block enough of the sun’s light to help reduce algae growth. EcoBoost binds suspended organic particulate and locks up excess nutrients to keep your pond water clear and polished all season long. Barley Straw Pellets are also effective at reducing filamentous alge, especially if added early in the season. As the barley breaks down, it releases tannin and other compounds that inhibit algae growth. 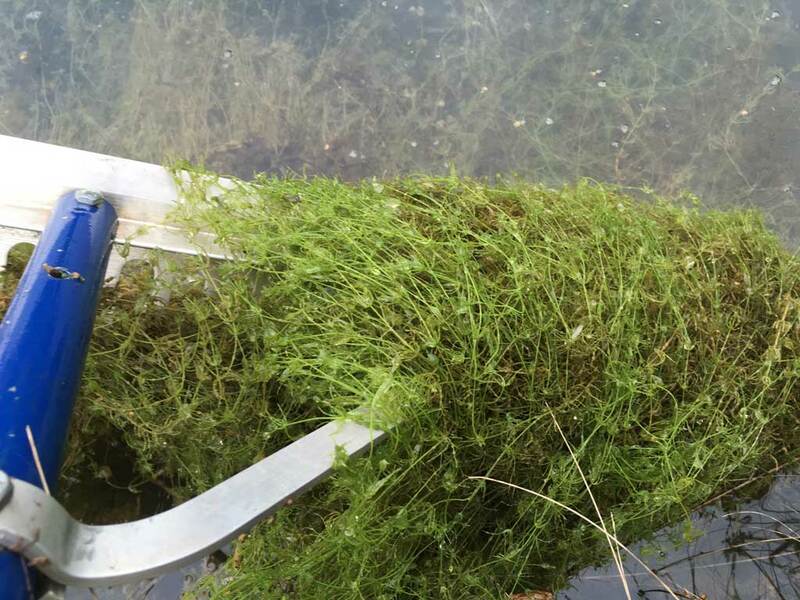 When filamentous algae is floating on the surface of the pond, it can removed with a lake rake or parachute skimmer. Chara (also known as Muskweed) is an algae that actually looks like a submerged plant, in fact, it often gets confused with coontail. It is a large, bright green branching algae that has no roots and also has a distinctive odour. When pulled from the water it has a noticeable garlic-like smell. Chara will form dense mats that can cover large areas if left alone. Spirogyra AKA ‘green slime’ or ‘pond scum’ grows in long single strands. these strands usually grow together forming dens mats of algae. In early spring, Spirogyra and other similar types of algae grow at the bottom of the pond in shallow water. During warmer weather, thick mats of algae form at the surface as tiny bubble of oxygen produced by the algae, become trapped in the algae. Planktonic algae is a microscopic algae that makes ponds cloudy. In mild cases, the pond becomes slightly hazy and does’t ‘sparkle’ like it once did. 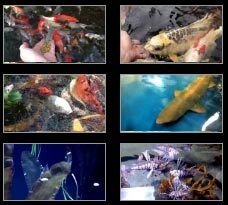 In more severe cases, the pond water can turn very green and cloudy, reducing visibilty to only a few inches. Planktonic algae blooms may be temporary and last only a few weeks, or they can be an ongoing problem that reoccurs each year. There can be many different causes of algae blooms. The most common is often an organic sludge layer on the bottom of the pond releasing into the water. However, it can also be the result of nutrient rich runoff water entering the pond from farmers fields, recently fertilized lawns, or even nutrients from other ponds ‘upstream’. Once planktonic algae is growing in the pond, it can’t be physically removed because each algae cell is microscopic. This algae must be controlled by other means. Early in the spring, planktonic algae can often be controlled with pond dye, such as Natures Blue, Twilight Blue or Black Dyemond pond dye. Add the pond dye early in the spring, before the algae begins to grow too quickly, keep re applying the dye to keep the colour from fading. Pond dye can block enough of the sun’s light to prevent the algae from growing. EcoBoost binds suspended organic particulate and locks up excess nutrients to help starve the algae. Planktonic algae usually turns ponds varying shades of green. This pond was about as close to ‘Pea Soup’ green as it gets! Not all ponds turn green. Planktonic algae is usually the cause of the murky water in ponds that are brown in colour. There are several effective products to help improve water quality, water clarity and reduce sludge in your pond. 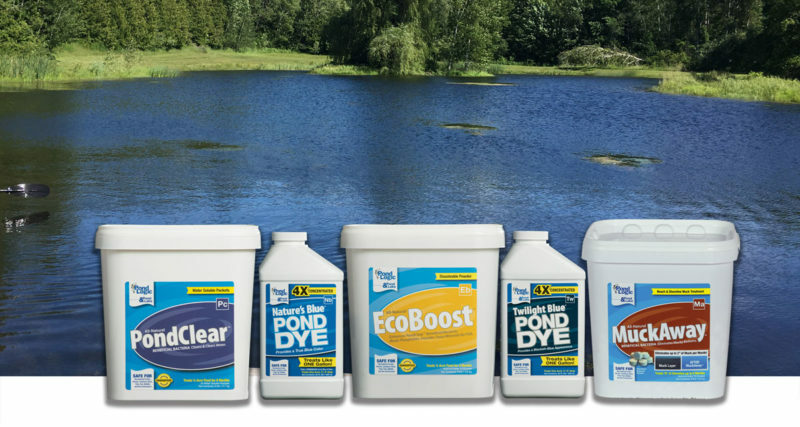 EcoBoost – improves pond clarity and reduces algae growth by locking up excess nutrients As it is not affected by water temperature, it can be applied early in the spring. MuckAway – Eliminates pond muck and sludge that accumulates at the bottom of your pond. Reducing sludge will reduce the nutrients that feed algae and unwanted pond weeds.